"...a vehicle for multinational consolidation of commercial and banking interests..."
26Feb01 - Annual meeting of the Trilateral will cover "globalisation and governance"
Recent events in the Irish republic concerning the corrupt activities of various politicans and businessmen have resulted in the establishment of various tribunals to investigate their activities. one politican who has been jailed as a result of not co-operating is a dublin T.D. (member of the Irish parliament) L. Lawlor. In a profile feature of Liam Lawler in the Sunday Business Post a Dublin based newspaper published on 3rd of Febuary 2002 it revealed that liam lawler was a member of the Trilateral Commission. this is the only reference I have seen to this piece of information and it might be of information to you . The next annual meeting of the Trilateral Commission (which gathers together leaders from the European Union, Japan and the United States) will take place from 9 to 12 March, in London, and will concentrate on issues concerning "Globalisation and Governance". Among the main speakers will be the Secretary of State for the Foreign Office Robin Cook, the European Commissioners for External Relations Chris Patten and the Internal Market Frits Bolkestein, the WTO Director General Mike Moore, the Speaker of the National Assembly of South Africa Frene Ginwala, the Special advisor to President Putin Serguei Yastrzhembesky, the former Mexican President Ernest Zedillo, the former Korean Prime Minister Lee Hong-Koo and the former American Ambassador to the United Nations Richard Holbrooke. In London, Peter Sunderland (acting President of BP Amoco and former European Commission, as well as former GATT Director General) will take-over from the former German Finance Minister Otto Graf Lambsdorf as chairman of the Trilateral. "The Trilateral Commission is something between a 'tank of thinking' and a club of discussion", Jakob Andersen wrote. Frequently it holds seminars and produces reports about subjects like 'How We Preserve The Peace In A World After The Cold War'", Jakob Andersen wrote. "Between the meetings the members try to influence their own govern-ments, the economic life and other to do, as the commission wishes", Jakob Andersen wrote. "The Trilateral Commission is attacked by both right-wing-extremists and left-wing-extremists. It is accused of among other things establishing a government of the world", Jakob Andersen wrote. "The commission stands behind the international trade with narcotics, following the half-fascist American politician Lyndon LaRouche", Jakob Andersen wrote. The commission represents the interests of the multinational businesses and banks. So it is in direct inconsistency to the interests of the workers and the Third World", Jakob Andersen wrote. "A. Volcker (the former chief of the American Federal Reserve System) and many others can pull strings that to us mortal ones are invisible", Jakob Andersen wrote. Ritt Bjerregaard (the Social Democratic Party), Joergen Schleimann (Left-Liberal) are members, and they were invited with the other influencial in the visible top in Denmark. "The Danish Social Democrat and the American high-capitalist walk in this way hand in hand. The Danish editor-troll (mine: Thoeger Seidenfaden) and the experienced giant from the intimate scene of the world (mine: Henry Kissinger) are in partnership", Jakob Andersen wrote. (So far some of the content of the article 'Private Top-Meeting'). If you are too self-opinionated, because you eventually have got 'a warped upbringing', you will not fit into the systems/the agencies/the commissions/the groups, not even on the first stage. I have been instructed about this. Diligence and skill are accepted with this BUT. As to the last mentioned Jakob Andersen does not seem to be problematic in relation to the politically correct article mentioned above. It would have been a pity, now it is the first time that any Danish newspaper writes anything at all about the Trilateral Commission. But did he really write anything, at all. Yes the chosen words were in order and the order in which they were men-tioned was right too, I think. Perhaps Jakob Andersen lacked for the good order "Large-scale Socialists", if this conception should not be included in the one of the other used categories from The Common, ruled by The Common, that is itself - 'a hole or idling in the head'. Perhaps the reader knows that the most text-writing-systems are equipped with a so-called spelling-control, also for foreign languages. The control can be supplemented by the user himself, and this is very fine by many occasions. But what shall we do with the following that I originally presented for the Danish readers. They had no problems of understanding, I presume. I take only one the easy-explained ones from the Danish edition. In Danish you can ask the following question and get the following answer: You can! Faar faar faar? Faar faar ikke faar, faar faar lam. 1. Sheep, sheep, sheep? Sheep sheep not sheep, sheep sheep lambs. 2. Do sheeps bear sheeps? Sheeps do not bear sheeps, sheeps bear lambs. But it is not funny in English, at all. The reason to this is not insurmountable cultural differences between Englishmen and Danes. Certainly not. The Danish word 'faar' means 'sheep', 'sheeps', 'bear' or 'get' in English de-pending of how, where, and with which intonation you use that word, and this is the explanation to the peculiar sentence with eight times 'faar' in Danish. How did we end here? With my thoughts on the key names, and on Jakob Andersen's key conceptions, I suddenly wrote in the Danish version that it would be exciting to see the 'Faar-sentence' translated perhaps to to English or to German. I don't know why. Below are two letters to the editor of the New York Times that you might find interesting. One letter was written on August 14th 1980, by George Wald, emeritus professor of Biology at Harvard and co-recipient of the 1967 Nobel Prize for Medicine. Wald's letter was published on August 19th, 1980. The other letter was published a day latter. It is a reply to Wald's letter from David Rockefeller. Read Rockefeller's letter first, write down what you think Wald accused the Trilateral commission of. Now read Wald's letter. What type of a person do you think David Rockefeller is? Why did the times publish the letters one day apart, instead of together? I never ceased to be amazed at those few among us who spot a conspiracy under every rock, a cabal in every corner. Surprisingly, the latest to join the conspiracy theorists is Professor George Wald, a Nobel laureate, who postulates in an Aug. 19 letter that "John Anderson's try for the Presidency was invented by, or with the connivance of, the Trilateral Commission to cut into the Democratic vote..."
Professor Wald, alas is not alone in his suspicions. To some, the Trilateral Commission is a sinister plot by Eastern Establishment businessmen who will do almost anything - including going into cahoots with the Kremlin - for the sake of financial gain. The fact that many former members, including President Carter, are now members of the Administration is hailed as proof of how devilishly well the conspiracy works. As founder of the Trilateral Commission and its current North American chairman, I am usually singled out as the "cabalist-in-chief". One recent tirade had me orchestrating a plot "...to reduce New York's population to approximately four million and siphon off the surplus population into slave labor camps..." The same publication asserts that I'm already responsible for a fascist scheme in Latin America that "...led to shifts in global weather patterns, marked by droughts and severe winters in the United States." Originally, this sort of nonsensical defamation was easy to dismiss. It came from the extreme fringes of the left and the right, and I suppose being called a Communist and a fascist at the same time puts me somewhere near the center of the political spectrum where I am most comfortable anyway. Lately though, the drum beat of inanities has grown louder, and a few overactive imaginations have attempted somehow to link the commission with the 1980 Presidential election campaign. I thought therefore that Professor Wald and his co-conspiracy theorists might appreciate an explanation of the mysterious organization that seems to haunt their every moment. I am afraid the reality is much less juicy than the theories. The Trilateral Commission now has about 300 members from North America, Western Europe and Japan. About one-quarter are from the United States and include not only business people, but labor union leaders, university professors and research institute directors, congressmen and senators, media representatives and others. There are about as many Republicans and Democrats, and most regions of the nation are represented. Among present and former U.S. members are the chairman of the Republican National Committee, the president of the A.F.L.-C.I.O., the publisher of the Chicago Sun-Times and others who surely would have difficulty hatching the same plot. The Trilateral Commission does not take positions on issues or endorse individuals for elective or appointive office. It holds meetings that rotate from region to region and assigns task force reports that are discussed in commission sessions. Reports have dealt with different aspects of world trade, energy resources, the International Monetary System, East-West relations and more. Is the commission secretive? Not at all. For $10 a year, anyone can subscribe to its quarterly magazine, "Trialogue," and also receive periodic mailings of task force reports. Further, we publish a list of the source of all U.S. contributions in excess of $5.000. The only part of our proceedings that is "off the record" are discussions at commission meetings, and we keep these private to encourage uninhibited criticism and debate. Is the commission exclusive? Yes, in that we try to select only the most able and outstanding citizens from the industrial democracies. In that context, it is gratifying and not at all surprising that many former members are now Administration officials. My point is that far from being a coterie of international conspirators with designs on covertly conquering the world, the Trilateral Commission is, in reality, a group of concerned citizens interested in identifying and clarifying problems facing the world and in fostering greater understanding a cooperation among international allies. My apologies, Professor Wald, But, as Walter Cronkite would say, "That's the way it is." I have a suspicion approaching conviction that John Anderson's try for the Presidency was invented by, or with the connivance of, the Trilateral Commission to cut into the Democratic vote and so secure the election of Ronald Regan. The Trilateral Commission, founded by David Rockefeller in 1973, is so called because it brings together top corporate and financial power, plus a supporting cast of academics, politicians and labor union heads from North America, Western Europe and Japan. 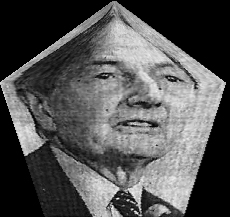 David Rockefeller is its North American chairman. Both John Anderson, the Independent candidate, and George Bush, Republican Vice Presidential candidates are or were members. Since the entire listing from the U.S. included only 92 members, 18 in "public service," the Trilateral Commission is offering an extraordinary concentration of major aspirants in the coming election, covering, as it happens, all three political constituencies. In a sense, John Anderson represents a replay of Jimmy Carter's 1976 candidacy, Anderson and Carter were both members of the Trilateral Commission from its inception. Both became candidates out of obscurity: Jimmy Carter a peanut warehouseman and one-term Governor of Georgia; John Anderson an undistinguished Republican Representative from Illinois. Both come forth as mavericks; Carter as the anti-Washington, anti-Establishment Populist; Anderson, a right-wing Republican with what liberal Democrats regard as a dismal voting record in the House suddenly emerging as a forthright liberal reaching out for the independent vote, the Democrats disillusioned with Carter and the single-issue voters; anti-nuke, pro-abortion, anti-draft, pro-E.R.A., pro-gun control - that last an almost sure formula in the past for losing elections. But if I am right, Anderson was not designed to win this election, but to cut into the Democratic vote. Running initially as a candidate for the Republican nomination, he displayed his new political image and made his name recognizable. Then we were treated to his agonizing decision whether to run as an Independent. No agony. As a Republican candidate he had already been eliminated by Regan. To cut into the Democratic vote, he had to run as an Independent. His recent conference with Senator Kennedy seems to me more of the same. It says to American voters: See, I'm not only closer to the Democrats than to the Republicans, I'm like a real, authentic Democrat such as Senator Kennedy, who even agrees that we are close together on (some) issues. What all this means, if I am right, is that David Rockefeller and his Trilateral Commission, having had four years of Jimmy Carter, have decided that they can do even better with Reagan and their man Bush. Henry Kissinger, political adviser to the Rockefeller family and member of the executive committee of the Trilateral Commission, hailed Reagan at the Republican convention as "the trustee of our hopes." I think that John Anderson is the instrument designed by the Trilateral Commission to assure Reagan's election. The writer is emeritus professor of Biology at Harvard and co-recipient of the 1967 Nobel Prize for Medicine. A superficial glance could lead external observers to the conclusion that on the economic, monetary and social fronts, there is and will be "nothing new in Western Europe" - the title of a famous book - in the near future. OECK projections (see Table 1) seem to corroborate that misperception. I propose to analyze what lies behind these figures. What are some of the forces at work? What are some of the momentous political decisions being taken, which may alter the economic, social and political landscape of Europe before the turn of the century? EMU and the European welfare states will be at the center of our thought process. My presentation will be in two parts. We will first review economic developments within major European countries. Then we will probe into the hidden part of the iceberg, the nature of the political scheme that is unfolding. Germany is both a key country and the center of a monetary and economic zone which includes Austria, Belgium, the Netherlands and Denmark and now extends beyond the EU to the Czech Republic and Slovenia. This is illustrated by the fact that short- and long-term interest rates in these countries, over a protracted period of time, vary little (between 0% and 1%) from German interest rates. That linkage, combined with the reality of the intertwining of these economies with that of Germany, suggests that we may already have at work a small-scale version of EMU in Europe. What happens to the German economy - a three trillion DM economy - is important in terms of EMU in its broadest sense and in terms of the social dimension of the European Union. The OECD projections in Table 2 require a few comments. In spite of a rate of capital formation 30 per cent higher than that of Great Britain, the German economy is in quasi-stagnation and unemployment is high. However, the public deficit will have been brought well within the Maastricht criteria by 1998. First is the evolution of the exchange rate of the DM. The volume of German exports has a negative sensitivity to prices of 0.5, which means that an increase in prices of 10 per cent reduces volume by 5 per cent. A year ago the DM appreciated by 28 per cent in relationship to the dollar, by 27 per cent in relationship to the lira, by 17 per cent in relationship to the pound. These rates of appreciation have been more than halved since then but their impact on economic growth rates an unemployment has been far from insignificant. Second, under the label Standort Deutschland, Germany is implementing fairly radical policies in terms of deregulation, public deficit reduction and the overhauling of "corporate Germany" (as evidenced by the changes in Bayer or in Mercedes). This quiet revolution is happening a decade later than in the United Kingdom and the United States. As is normal in that kind of process, the economic and social costs are borne upfront, with the corresponding impact on GDP growth and unemployment. The contrast with the performance of the United Kingdom is significant. In the United Kingdom, the GNP growth rate has been higher than Germany for the last two years, by more than 20 per cent. The OECD projects that the U.K. growth rate for the next three years should at least match that of Germany. On a five-year basis, unemployment will have gone down by a good 2 per cent as a result of shrewd monetary policy and unemployment policies and a reduction of the active population. The public deficit, which was at 7.8 per cent of GNP a few years ago, is projected by the OECD at 2.8 per cent in 1997. It has been more audacious in the timing and implementation of deregulation, from telecommunications to water, from gas to financial services. The same can be said about privatization. The last coup d'eclat was done without blinking an eye, when the first track of railroad was leased to a French private company (which must say something about either the French or British Rail). The United Kingdom has also gone a long way towards cleaning up its boardrooms. Throughout the country, shareholders have made their voice heard and eased out management when it was less than competent. Like in the United States, the United Kingdom has created a fiscal environment conducive to the reemergence of a new class of entrepreneurs, of the Branson type. Finally the social cost of that deep a revolution has been softened by exchange rate adjustments, to the greatest benefit of Great Britain. Paradoxical as it may sound, the United Kingdom seems well positioned now to take on a leading role in Europe. We should adopt the attitude to the U.K. that Mrs. Thatcher adopted to President Mitterrand: "I do not listen to what he says. I look at what he does." In the case of the U.K., facts speak louder than words. The United Kingdom meets most of the Maastricht criteria. In addition it has made major strides in carrying out its internal revolution, at an acceptable social cost. So it has a legitimacy in terms of democratic and political tradition and domestic modernization, and that legitimacy allows it to play a leading role in Europe. But will the other powers in Europe, notably Germany and France, let it? Its GNP growth rate has been higher than that of Germany, by more than 20 per cent, for 1994 and 1995. It is projected to match Germany in 1996 and 1997. Its public deficit will be going down from 9.6 per cent to 6 per cent of GNP (and it could be erased if Italian interest rates were to decrease permanently by 3 per cent). The level of unemployment appears to be declining moderately, but the recent changes in statistical calculation methods invite us to be cautious. Finally, like France, Italy enjoys a healthy current account surplus, which should grow to $30 billion in 1997, from $15 Billion in 1994. So Italy might well be ready for EMU two to three years from now. The story of Italy is a repeat of that of other European Countries, including Spain and Portugal. More belatedly than the United Kingdom, but in keeping with its tri-millenium tradition, Italy has carried out Herculean tasks in terms of pension and tax reforms, deregulation and privatization. It is also overhauling its industrial base. Numerous changes in boardrooms have taken place with a view to accelerate the re-engineering of Italian industry. Like the U.K., Italy has protected its industry and cushioned the social cost resulting from the above-mentioned transformations by devaluing its currency. France has a 7 trillion Franc economy with remarkable convergence with Germany, be it in GNP growth, inflation or even the public deficit (see Table 3). The balance of trade between France and Germany is in equilibrium and, in contrast to Germany, France's current account balance is likely to be positive ($15-20 billion for the next three years, as last year). Like the rest of Europe, but later than the United Kingdom, France is carrying out massive internal reforms. The British may have to suffer some painful problems with their "mad cows," but the French are slaughtering battalions of sacred cows. Social security, health care, pensions, education, military industry, railways, and telecommunications are all being either revamped, deregulated, privatized or overhauled. the revolution is rapid, brutal and required opening up many battlefronts at a considerable human cost. In that sense, France, like Germany is no different from the rest of Europe, except for the hidden agenda, or what I called earlier the hidden part of the iceberg. What differentiates France and Germany from some of the other European countries is their common political commitment, across the entire democratic political spectrum, to the common European currency, as the lever to accelerate the political integration of Europe. It is the continuation, with another means, of the process initiated in 1952 when coal and steel were privileged as the symbol and reality of European unification. Forty-five years later, France and Germany are committed to money - with its broad basis, for it concerns every citizen and every organization - as the trigger for another leap forward in the European integration process. This is a political decision, with very significant social and economic consequences. In a first phase, it appears plausible that unemployment will rise and that the gap between rich and poor will widen, especially as the welfare state will be slimmed down to meet the Maastricht criteria on public deficits. In fact, the high social price of further European integration through EMU has been tacitly accepted, as illustrated by the absence of implementation of the Delors Plan for reduction in unemployment through large European public works. Because of the political decision to use EMU for furthering political integration in Europe, the social price may be even higher than it was for instance in the United States, where it proved to be significant. We all know that over the last 20 years the average earnings of the lowest-paid workers in the United States fell by 18 per cent, while the after-tax pay of U.S. management increased by some 60 per cent. On the other hand, America created 20 million jobs, while in Europe unemployment rose by the same figure. Europe will have to devise its own home-made solution to keep the momentum toward closer political unity through EMU while reengineering its industrial base and its welfare state systems. Europe - notably France and the DM-zone countries - would be well-advised to be inspired by certain aspects of the American experiment, lowering the price of less-skilled labor as a better human and financial policy than paid unemployment. Pragmatism will be of the essence, for the risk of ripping apart the national social fabric is not a gratuitous hypothesis. The December strikes in France, with one million people out in the street, are a useful reminder of the tensions caused by that evolution. This may be why the social ambitions of Europe are presently at the center of the French position on the future of Europe. The French position serves a domestic purpose, by placating the opposition on an issue which belongs to their natural agenda. But it also suggests an alternative to the free-trade zone notion of Europe of which the United Kingdom is a proponent, as well as to a Federal Europe supported by Germany. Sometimes, like their Canadian friends, when the French cross the road they stay in the middle. What have they found in walking to the middle and stopping? They have found a confederal Europe, with substantial self-government, and a common currency. In conclusion, Europe is changing at a wrenching pace and change has become more difficult to handle in social and political terms. But let there be no doubt: The European Community will not become an industrial museum. It will alter its welfare states and attempt to deepen its unification process by using EMU as a catalyst. Hervé de Carmoy is Chairman of Banque Industrielle et Mobiliere Privée (Paris) and former Chief Executive of Société Générale de Belgique (Brussels). The article quotes Paul Volcker. The article tells us the Trilateral Commission was founded by David Rockefeller. The article doesn't mention Volcker and Rockefeller are Council on Foreign Relations members. Or, that Council on Foreign Relations members Zbigniew Brzezinski, and Jimmy Carter helped Rockefeller found the Trilateral Commission. Council membership is by invitation only, and restricted to American citizens. The Trilateral Commission is an inner circle of Council on Foreign Relations members. The RoundTable website contains a 1992 list of Trilateral Commission members [ http://www.geocities.com/CapitolHill/2807/CFRTClist.html ] . It contains 337 names, 316 are found on various Council on Foreign Relations (1992,1990,1988,1987,1985,and 1984) membership lists. The other 21 people are either Americans not found on these Council on Foreign Relations rosters, or are European and Japanese members. The current plan to bomb Serbia, is the latest example of this sort of Council on Foreign Relations psycho-political operation. On March 18th, Council on Foreign Relations member Madeleine Albright announced, "..if Belgrade doesn't reverse course the Serbs alone will be responsible for the consequences and I would like to remind President Milosevic that NATO stands ready to take whatever measures are necessary." As we all know, in Council on Foreign Relations members Albright and Clinton's book that means bombing the Serbs. Increasingly, it appears, key members of Congress are beginning to suspect that they have been lied to by the Clinton White House and are showing signs of real concern that the entire nation is about to become perpetrators of an attack upon a sovereign nation that could involve not peacekeeping but guerrilla warfare. Council on Foreign Relation member Clinton's Whitehouse contains 300 or more Council on Foreign Relations members he appointed to the CIA, NSC, State Department, and other agencies. Whose orchestrating the lying, Albright, Clinton, the Clinton Whitehouse, or the Council on Foreign Relations? The psycho-political operations are developed through "discussion-groups." Council members attending the "discussion-groups" study different policy issues exploring and presenting divergent views. The discussion is recorded and a digest of the discussion is produced. The material is used to create news articles and essays designed to appeal to well targeted influential decision makers in diplomacy and international relations. The Council on Foreign Relations member controlled media industry broadcasts the propaganda. "Discussion-group" sessions are closed to news coverage, but are attended by Council on Foreign Relations members who are prominent news and media figures. Security is usually tight, keeping the general public and news media out of the discussion, and identifying, photographing, adding as many "outsiders" as possible who do show up, to a list of potential "security" threats. "Discussion-groups" were a Rhodes' Secret-Society instrument developed and used to influence public opinion. The Institutes of International Affairs adopted their use. "Study-Groups" are formalized "discussion-groups" used by the Council on Foreign Relations and its branch organizations in other nations; Council controlled think tanks such as, Rand, Brookings, Council for Strategic International Studies, and the John Hopkins Nitze School of Advanced International Studies; and, Council controlled governmental agencies like. the Central Intelligence Agency, and the State Department. The meetings are limited to a small group experts. Tight security is provided. Discussions and material generated are often classified. The material is used to produce classified reports and digests meant to influence select groups of high-ranking public officials, as well as articles, essays and stories meant to influence the public to accept the proposed national policy decisions. By 1936 Institutes of International Affairs were established in Canada, Australia, New Zealand, South Africa, India, and Newfoundland. Each Institute , under the guise of world peace, concentrated on influencing national-policy to achieve unity of all nations under one world government. By controlling public opinion tension is created between nations wary of losing their national identity, mores, and cultures, resulting in a state of perpetual warfare used to justify peace-time National Security Emergency measures and large military budgets. The groups goal was to maximize Institute member industry profits by selling both guns and butter. Could the reason famous economist John Kenneth Galbraith has never written a book exposing the Council on Foreign Relations effect on the economy because Galbraith , is a Council on Foreign Relations member? In 1918 a group of international lawyers and high-ranking officers of banking, manufacturing, trading and financing companies, headed by Theodore Roosevelt's Secretary of State Elihu Root, founded the Council on Foreign Relations. Its purpose was to promote commerce through contact with distinguished foreign visitors. After returning from the Paris Peace conference the American Institute of International Affairs approached the Council on Foreign Relations and proposed a merger. On July 29, 1921, the American Institute of International Affairs merged with the Council on Foreign Relations adopting their name. The new Council on Foreign Relations adopted the American Institute of International Affairs policy -- unity of all nations under one world government. In 1925 ten independent national councils holding territory in the Pacific Area were created to extend the influence of the Royal Institute of International Affairs and Council on Foreign Relations into Russia and the Far East. Institutes of Pacific Relations were established in an interlocking fashion with four existing Institutes of International Affairs (Britain, Canada, Australia, New Zealand) and the Council on Foreign Relations in the United States. Institutes of Pacific Relations were established in five additional countries 1. China, 2. Japan, 3. France, 4. the Netherlands, 5. the Soviet Union. By 1939 the Institutes of Pacific Relations in the four British areas had merged with the local Institutes of International affairs. The American Institute of Pacific Relations remained a Council on Foreign Relations front organization until it was eventually dissolved after the McCarren Committee investigation in 1951. The Institutes of Pacific Relations held joint meetings every two years. If any wrong-doings resulting from the psycho-political operations are discovered Congress will focus their investigation on the Trilateral Commission and not the Council on Foreign Relations.If such an investigation does take place, you will find, as in past congressional investigations, such as the Rockefeller Commission , the Church Committee, the Warren Commission, and the Tower Commission, that many of the Congressional investigators are members of the Council on Foreign Relations. When the investigators, and those investigated, are closely connected, and the investigators don't disqualify themselves because of prejudice or personal interest, hasn't a crime called conspiracy to obstruct justice been committed? If the investigators are high-ranking public officials aren't the crimes high crimes, that call for impeachment and trial before Congress? Have you requested your elected representatives to call for a Congressional investigation of the Council on Foreign Relations? FYI: Can any of you speak Greek? A friend sent a link to a website about Athanasios Strigas. The website seems to be a work in progress. The website says," Athanasios Strigas is an agent of NATO and the Trilateral Commission and has written more than 8 big books about the Trilateral Commission and the politics in general...His books are written in Hellenic and are related mainly to the connection and the involvement of the Bilderberg Club in the Hellenic politics and political events (Turkish invasion in Cyprus,Military junta etc.). Nevertheless they give very much information on the Trilateral Commission,Bilderberg Club,NSA,NATO and the secret agencies." The website contains Library of Congress listings of Strigas's books. The website is at [http://www.geocities.com/Athens/Forum/8604/strigas.zip]. >meetings in Washington, which ended Monday. >not tight and some media figures belong to the commission. >Membership includes academics and industrial and former political leaders. >Current members of national governments are excluded. >China and no one said China should not respect human rights. >United States, Japan and Europe. >FOREIGN RELATIONS MEMBER ] Volcker, assessing the value of the meetings. 12th Oct. 96: EU/UNITED STATES/JAPAN - THE EUROPEAN GROUP OF THE TRILATERAL COMES TOGETHER. Brussels, 11/10/1996 (Agence Europe) - The European members of the Trilateral Commission (bringing together for some twenty years now political leaders from Europe, America and Japan) began their annual meeting in Helsinki on Friday 11 October, meeting that will end on Sunday 13 October. Meeting under the Chairmanship of former Finance Minister Count Otto Lambsdorff, the group will reflect on: 1) the Finnish scene, under the Chairmanship of Max Jakobson, Head of Finland's Trilateral Group; 2) the Baltic nations, with the special participation of Lennart Meri, President of the Republic of Estonia; 3) the European Union in progress, with European Commissioner Mario Monti, and Voker Ruhe, Germany's Federal Minister of Defence; 4) Europe's enlargement and security, with Polish Foreign Minister Dariusz Rosati. 19th April 1996: EU/TRADE - EU/NORTH AMERICA/JAPAN TRILATERAL COMMISSION MEETS IN VANCOUVER (CANADA). Brussels, 18/04/1996 (Agence Europe) - The annual meeting of the Europe-North America-Japan trilateral commission is to be held from 20 to 22 April in Vancouver (Canada) under the chairmanship of Paul Volcker (United States). It will be co-chaired by Otto Graf Lambsdorff (Europe) and Kiichi Miyazawaqui (Japan). Debates will focus on the implications for the trilateral countries of Asia-Pacific regionalism and security concerns, as well as on NAFTA and the host region's political and economic developments. Europe's fundamental challenges and Japan's search of a new framework will also be presented. Two reports to the Commission will be discussed in Vancouver: "Maintaining Energy Security in a Global Context" and "Globalization and Trilateral Labour Markets" (to be published in the summer). The European Trilateral members will highlight Europe's presence and future prospects in the world's fastest growing economic area, in the footsteps of the recent EU-Asia ASEM Summit in Bangkok. Behind closed doors (of course), they are meeting this weekend in Lisbon. Some call them "the shadow government," "the Establishment," the "global elite" that runs the world. Depending on which conspiracy theory you subscribe to-and the Trilateral Commission has found its way into many-this 19-year-old organization is anti-American, anti-democratic, anti-Christian or anti-worker, and is scheming ultimately to abolish the sovereignty of nations and establish one world government! According to Lyndon LaRouche, fringe political candidate and convicted tax cheat, the Trilateral Commission is behind the international drug trade. A writer affiliated with the far-right Liberty Lobby says the commission is forever plotting to raise taxes on Americans, siphoning the money overseas. Evangelist Pat Robertson believes it is somehow linked to Freemasonry and the occult, that it springs "from the depth of something that is evil." Preposterous, say members of the Trilateral Commission. It is merely a "discussion group" on world affairs, composed of high-level corporate and public-policy types from North America, Western Europe and Japan. The commission seeks only to promote international cooperation, for the betterment of everybody. Nothing sinister. Its annual reports and task force papers are available for the public to read. Its membership list isn't secret. Just ask and the commission will send you stuff. Anyone who can dial directory assistance can get its New York phone number. Still, plenty of ordinary, educated people have no idea what the Trilateral Commission is or what it does, even though its former members include George Bush and Jimmy Carter. There is a shroud of mystery around it. The press secretary for Arkansas Gov. Bill Clinton's presidential campaign didn't even know that Clinton is on it! (Yes, Clinton is a Trilateralist too. They do run the world! The thing is, it has nothing to do with belonging to the Trilateral Commission. The TC is like a club for people who run the world anyway. Like Paul Volcker, former head of the Federal Reserve System, who is the commission's new North American chairman. And Akio Morita, chairman and chief executive officer of Sony, the Japanese chairman. And Count Otto Lambsdorff, leader of Germany's Free Democratic Party, the European chairman. Who else is on it? Well, as of last April, top executives of AT&T, ITT, Xerox, Mobil, Exxon, the Chase Manhattan Bank, First Chicago Corp., General Electric, TRW, Archer Daniels Midland, PepsiCo, RJR Nabisco and Goldman Sachs (not to mention Nissan, Toshiba and Fuji Bank). And such former foreign-policy ultracrats as Henry Kissinger, Zbigniew Brzezinski, Robert S. McNamara and George Shultz. And five U.S. senators, including John D. Rockefeller IV (of course). And House Speaker Tom Foley. And some professors. There is a handful of women, including Katharine Graham, chairman of The Washington Post Co. (Chills run up spine.) A few black people too. Los Angeles Mayor Tom Bradley, for instance. But basically we're talking about lots and lots of middle-aged white guys. Who's not on the Trilateral Commission? Not one professional athlete, playwright or pop star. Hey, who do you want running the world? Ted Danson? From Right to Left Maybe because it meets behind closed doors, maybe because it's packed with powerful international capitalists, maybe because one of its principal founders was banker David Rockefeller, whose surname reads like "666" to those who demonize the Eastern Establishment-whatever the reason, some folks just suspect the worst of the Trilateral Commission. "These are not the types of people who get together for innocuous chitchat," says Jim Tucker, who writes for the Spotlight, newspaper of the Washington-based Liberty Lobby. Let us survey the thickets of anti-Trilateralism. "With the takeover by the Trilateral Commission of the United States government, through Jimmy Carter, there was an explosion of the drug culture and related degeneracy throughout the country." That's from "A Program for America," published in 1985 by the "LaRouche Democratic Campaign." "It is a largely unspoken reality," the book continues, "that the bankers and the IMF (International Monetary Fund) encourage dope growing and traffic as 'profitable free enterprise'-for the bloodsucking bankers!" Co-conspirators, according to LaRouche, include the British monarchy, the Soviet Union and the "Zionist Lobby." "A single thread runs from the White House to the State Department to the Council on Foreign Relations to the Trilateral Commission to secret societies to extreme New Agers. There must be a new world order. ... There must be world government, a world police force, world courts, world banking and currency, and a world elite in charge of it all. "I do not believe that normal men and women, if left to themselves, would spend a lifetime to form the world into a unified whole in order to control it. ... No, impulses of that sort do not spring from the human heart, or for that matter from God's heart." Tucker, like Robertson, challenges the Trilateralists' "cover story" that they're encouraging international cooperation for everyone's betterment. "We can have trade with other nations, we can welcome their tourists, we can send food to starving children in Biafra," he'll tell you. "But not a U.N. flag flying over Old Glory." He calls himself a longtime observer of the Trilateral Commission as well as the Bilderberg Group, which since 1954 has sponsored annual off-the-record policy discussions among prominent Western Europeans and North Americans. (Unlike the TC, the Bilderberg group has no formal membership. It is run by a chairman, a steering committee and an international advisory group.) Tucker sees Trilateralists, Bilderbergers and the New York-based Council on Foreign Relations-established in 1921 and long led by David Rockefeller-as a single elite network of globalists. Tucker has traversed the United States and Europe to be near their meeting places, he says. Once, he even crashed a Trilateral Commission meeting. "I didn't understand it because the guy was speaking German. It was kind of dull. A few minutes later, though, I was tossed out." With a friendly chuckle, he adds, "It's a lot of fun being a right-winger, you know?" Tucker also says he's got a source inside the Bilderberg group "whose name I only know as Pipeline." And it was Pipeline who provided Tucker with this stunning scoop in the April 20 edition of the Spotlight: Last June, Bill Clinton was "anointed" the Democratic presidential nominee by the Bilderberg group! "I think the whole thing is rather ludicrous," says Clinton campaign spokesman Jeff Eller. "Governor Clinton made the decision to run and wasn't handpicked by anybody." Criticism of the Trilateral Commission comes from the far left as well. To Holly Sklar, who edited the 1980 anthology "Trilateralism," the commission "represents the interests of multinational corporations and banks," which means it's contrary to the interests of Third World countries and workers all over. It wants wages kept low. It wants voters kept apathetic and polarized. The Trilateral Commission is not a "conspiracy" and is not "omnipotent," Sklar says. "But that doesn't mean it's not influential." For example, she says the commission set out to economically "co-opt" OPEC, persuading countries like Saudi Arabia to put their petrodollars back into Western banks, and to buy weapons from the West, instead of investing in developing countries. "I think that their vision of world order is not a world order that is good for most people," she says. "(It has) led very much to a system where a few people are enriched at the expense of very many." Global Cooperation "I certainly don't see our purpose as one of protecting the interests of multinational corporations," says Charles B. Heck, North American director of the Trilateral Commission. "We're trying to think about foreign policy issues in as broad a framework as we can. I see us serving a very broad public interest." Heck has heard all the attacks and critiques before. In fact, he used to do a lot of radio talk shows, particularly around 1979 and 1980. "That seemed to be when the mythology was most intense." People had taken note of the number of former Trilateralists in the Carter administration. There was Zbigniew Brzezinski, Carter's national security adviser, the man considered the ideological godfather of Trilateralism. And also Walter Mondale, Cyrus Vance, Harold Brown, W. Michael Blumenthal, Andrew Young. During the 1980 presidential campaign, Bush's Trilateralist background is said to have disturbed Ronald Reagan's supporters on the far right. On top of that, third-party candidate John B. Anderson was a Trilateralist too. In Heck's view, right-wing anti-Trilateralism has always been rooted in simple isolationism. "This country finds it difficult to be so interdependent with the rest of the world, given our history and our national traditions," he says. "It's a hard lesson for (Americans) to grasp." The idea behind creating the commission, he says, was that "the United States would never again be in such a singularly dominant position as in the immediate post-World-War-II era, and that leadership in the world would have to be shared." Now, such matters as the ecology-a new focus of Trilateralist study-will require global cooperation, Heck says. And that doesn't mean one world government. Nor does it mean that the Trilateral Commission even speaks with one voice, he says. It isn't a lobbying group. "There are wildly overblown notions out there about what a group like this does and can do," he says. "There aren't lists of recommended actions (that attendees) leave with and commit themselves to implement." Heck, in fact, expects about half of the commission's members to miss the Lisbon conference this weekend. We're talking about people, he says, who tend to be busy. Among the topics to be discussed are regional trade agreements, migration and refugees issues and post-Cold-War international security. Living Well A few working journalists are on the Trilateral Commission. And if a solid, straight-standing American journalist won't give you the real lowdown on what's happening behind closed doors, no one will. "It does not run the world," says Time magazine Editor-at-Large Strobe Talbott, who's been a Trilateralist for at least six years. "Present company emphatically excluded, it's made up of a number of highly influential people. The body itself does not presume some sort of unitary influence. In fact, quite the contrary. ... There's a lot of diversity. "The proceedings I would describe as much more like a large and high-powered seminar than a parliament or a board of directors," he says. David Gergen, editor-at-large at U.S. News & World Report, agrees. "These things sound powerful until you go to them," he says. "Then you find out that these are people who are genuinely interested in discussing things with each other. When private citizens can have those discussions in a frank and open way, that's helpful." Invited by David Rockefeller to join the commission last year, Gergen will address the Lisbon conference, along with Talbott, on the American political scene. And how does the gathering measure up as a social event? Cocktail wieners aplenty, or what? "I would not call the proceedings spartan," Talbott says. After all, these are people "who know how to live well and like to live well." He adds, though, "these are people who don't have to go halfway around the world for a good meal or a good bottle of wine. They come for something else, and that's the content of the discussion." Trilateral Commission, 35 avenue de Friedland, 75008 Paris. Tel. : 33/1/40.42.45.11 or Fax: 40.42.24.74. Trilateral Commission, 345 East 46th Street, New York NY 10017, Tel: 212-661-1180, Fax: 212-949-7268.